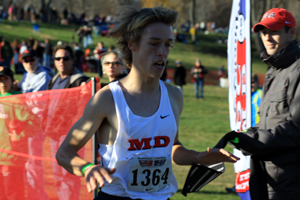 Clarksburg's Will Bertrand led Team Maryland to victory in the seeded boys race at the 7th Annual Battle of the Potomac Championship while the Maryland girls fell short to Team Virginia despite record-breaking performances from the top two Maryland girls. Bertrand hit the first mile in 4:56 while in second place. He maintained his position through the first major climb of the two loop course. At that point he said that he was feeling good so he decided he might as well push to win the race. He moved into first at about the halfway mark and won the 7th annual Battle of the Potomac by 11 seconds with a time of 16:34. Behind Bertrand, Maryland boys took four of the next five spots and put all ten scoring runners among the top fifteen scoring finishers. Maryland defeated Virginia 80 to 130 (the top ten runners from each state scored). After the state championship meet last week, Bertrand took several days off, but ran on Thursday and Friday of this week to tune up for this race. He intends to run at the Footlocker Northeast Regional race in New York City next weekend where he says he just wants to be near the top. In the photo shown above, Bertrand is breaking the finish line tape held by US Olympian Dathan Ritzenhein. In the Battle of the Potomac girls race, Ellie Gonzalez of Catholic High School led from the gun while B-CC's Caroline Beakes held back in the pack. 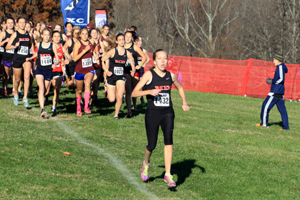 As with Bertrand, Beakes did not necessarily intend to give an all-out effort with the state meet just a week ago and another major race a week away (B-CC will travel to NXN regionals in Cary, North Carolina next weekend), but at the midway mark, she made a critical decision. "I was close to the front so I decided to go for it," she said. After one loop, Beakes was in fourth place but picked off two Virginia runners in the loop around the Christmas tree farm about two miles into the race. Unfortunately, it was not enough to help Team Maryland beat Team Virginia, but by chasing after Gonzalez, both Gonzalez and Beakes ran under the previous course record with times of 18:49 and 19:10 respectively. Virginia runners took 8 out of the 9 spots behind Beakes to give Virginia the advantage over Team Maryland, 88 to 122. Coaches Chad and Emily Young were the honorary coaches of Team Maryland and they were hoping to field their entire state-winning varsity team from B-CC to represent Team Maryland, but two of the top four were unable to attend. At the very least, it may have kept the race closer. The B-CC girls team hopes to be competitive at the NXN Southeast Regional Championship next weekend. The Walter Johnson varsity boys team will also compete at NXN as well as several individuals from across Montgomery County. If u want to run @ NXN register online individually. If that is why you wished you were WJ runner!! Your right wooton, wj just beat you by about 40 points in the state championship. NO BIG DEAL, RIGHT? Does anyone else think Will Bertrand somewhat resembles a younger looking Ryan Hall ?